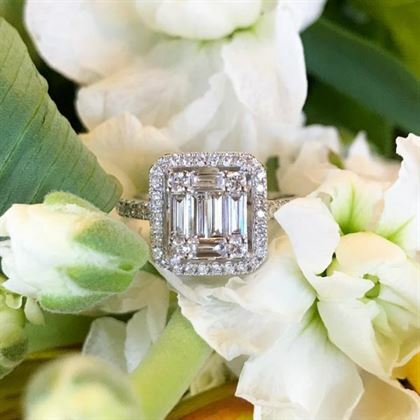 If you follow Bromberg’s on Instagram, you already probably realize that we take a lot of photos of jewelry. You might have even seen our Social Media Manager in our store taking photos with her iPhone 7 Plus. The majority of the photos we share on social media are taken with her iPhone 7 Plus. She has learned quite a bit about iPhone photography over the years through study and trial and error we are happy to share her best tips for taking amazing photos with your cell phone. • Clean your camera lens. This may seem like a no-brainer but it is imperative when it comes to getting a good shot. If you have ever our Social Media Manager taking pics around our store, you might even notice that when she lays her phone down to style a shot she always lays it with the lens facing up to avoid smudges. • Thoroughly clean your jewelry. If you are in the neighborhood stop by and we will get your bling looking photo ready in no time and free of change. If you are at home use a soft toothbrush and mild detergent to clean your jewelry, remembering to rinse completely and don’t dry it with anything that might leave behind lint. Even a tiny piece of fuzz stuck in a prong can ruin a close-up. • Get your hands photo ready. 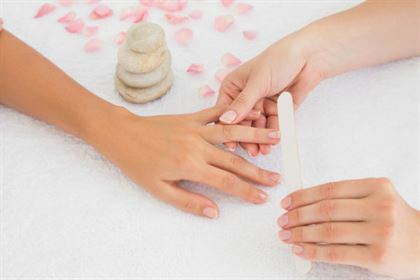 If you keep your hands perfectly manicured you are ready to go, but if not, now is the perfect time to get a manicure. If you don’t have time for a manicure, make your nails and cuticles look neat and hydrated. Do take your rings off when applying lotion. • Go towards the light. Great lighting is everything so get outside during what photographers call “the golden hour,” the first hour after sunrise or the last hour before sunset, to take ring photos if you can. If that isn’t possible, find a bright window to standby. Just make sure the sun isn’t shining directly through the window. The goal is directional light. Don’t be worried if it is overcast outside, as long as it isn’t too dark. The diffuse light of an overcast day can be your friend when taking photos of diamonds (or any subject, really). Shooting with window light is best on a cloudy day, after the sun has moved overhead away from the window, or near a window facing north. Avoid using flash as it will make your photos too “hot” and they will have a bad glare. 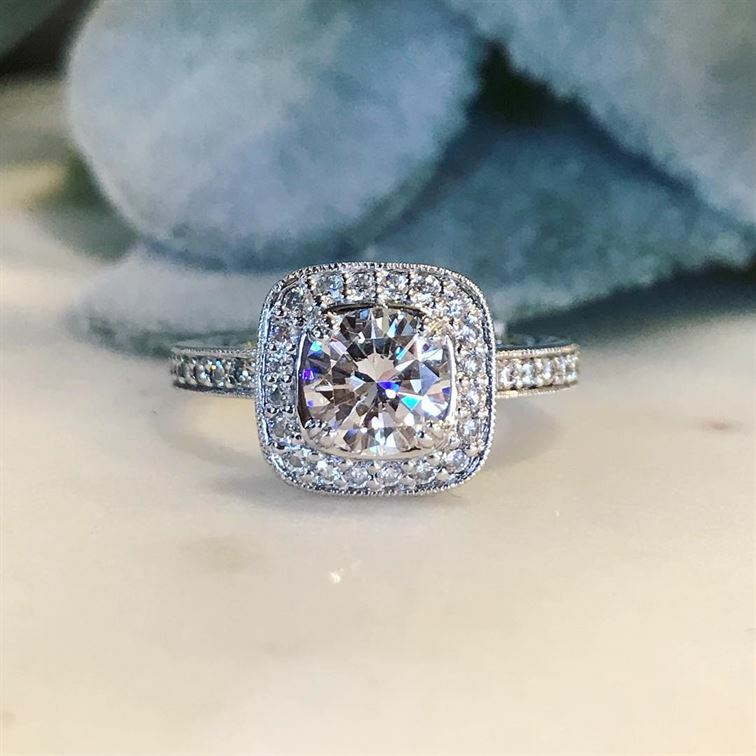 • Location, location, location… Look for a charming backdrop for your ring selfie, whether it is in your own backyard, a popular local spot, a natural vista, or while sightseeing on vacation. • Style your photo. There are as many unique ways to style your ring photo as there are people wearing rings. Some of our favorite ring pictures show an engaged couple holding hands, a hand being held up to the sky, a hand holding flowers or some other pretty prop, a downward looking shoe selfie showing the ring along with an entire cute outfit, a shot of the hand being held above or in front of a striking pattern (wallpaper, an open book, a brick or stone wall, a piece of art). Choose a backdrop or location that represents who you are as a couple. 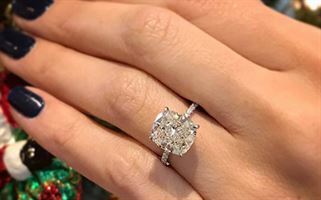 If you feel like your hands aren’t manicured enough to show off in pictures take a photo of your ring in its ring box, on a plant, in front of flowers or on an interesting surface (a wood or glass tabletop, granite countertop or draped fabric work nicely). 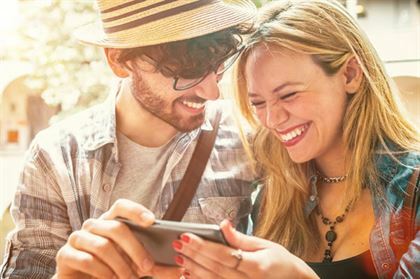 • Tips for getting a crisp shot… Many people say that you should not use digital zoom to get a good jewelry photo with a smartphone. This is true if you are trying to take a selfie holding your hand out in front of your phone. Use manual zoom instead, meaning you physically move your phone to zoom in or out. 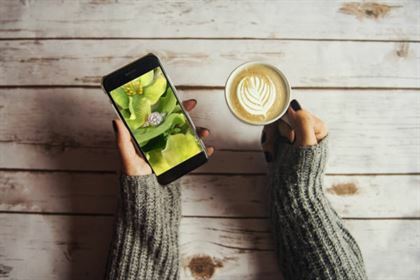 Start by bringing your phone fairly close up to your hand and tapping the area of the screen on which you would like to focus then drawing your phone further back and allowing it to focus again. Tap the screen again if it lost your preferred area of focus. Take many photos from several different angles. Moving your hand up and down and to the right or the left on very slightly can make a drastic change in how a diamond appears in photos. Our Social Media Manager says she actually get her best close up shots when she digitally zooms in 1.5 X, gets very close to her subject, taps to focus, then draws her phone back just a bit. She has learned that the iPhone’s autofocus will almost always take a clearer, crisper picture using this easy technique. • Up the resolution. Get to know the camera on your particular phone and make sure that you have upped the photo resolution to the highest size available on your device. • Hold steady and snap away! Another way to avoid blurry smartphone photos is to keep your phone as still as possible while you shoot. You can either use a tripod or steady your arm or hands against something nearby. If you don’t feel like you can hold your phone steady enough get your fiancé or a friend to help out. 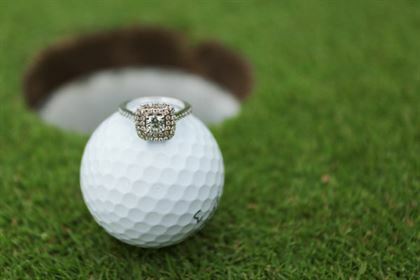 And the best way to get a great photo of your engagement ring with your smartphone is to take a ton of pics! Don’t be surprised if you find that only one out of every 10 to 20 photos looks good. • Edit before posting. Whether you are using your phone’s photo app or another photo editing app like Adobe Photoshop Express, Snapseed, VSCO, or something similar, you will want to think about your photo’s composition before you post. Things to consider are negative space, symmetry, framing, and depth of field.